Made of best quality non-tear water proof thick fabric, P.U. foam. 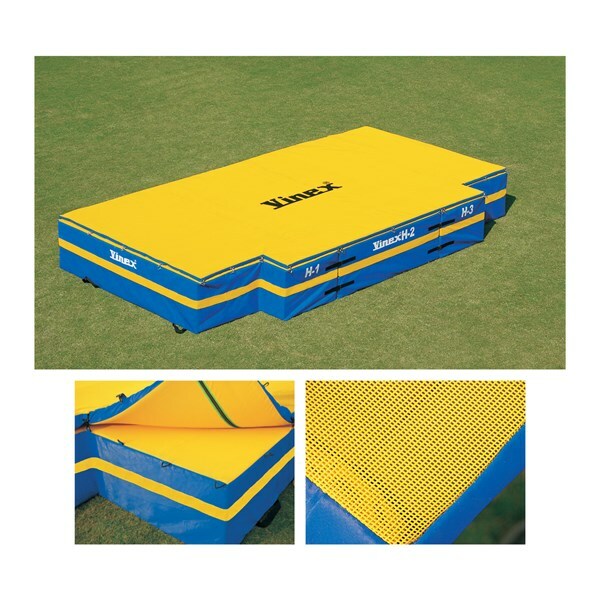 Especially designed for smooth and soft landing as per new IAAF specifications. Comes with spike proof top, Cover made of vinyl coated fabric for extra durability. Top of Base Unit is also covered with Vinyl coated woven polyester mesh fabric for superior strength. The mesh top allows the desired escape of air which provides maximum compression on landing. Consists of three base units and one top pad with four side handles on each base for easy carrying. Rain Cover for High Jump Pit. A new innovation from Vinex. 2-in-1 pits helps in eliminating the cost and storage of 2 different pits. An ideal product for training & practice. This pit is made of best quality non-tear water proof thick fabric and PU Foam. The special design of this pit allows for a smooth and soft landing. Comes with spike-proof top. Cover made of vinyl coated fabric for extra durability. Side straps on each base for easy carrying.